Want a bit of Nirvana history with your Anatomy class? 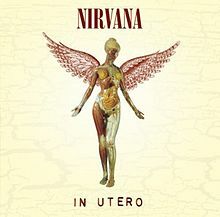 On September 13th 1993, American grunge band Nirvanareleased their much anticipated 3rd album, 'In Utero'. The album artwork is particularly significant if you're a fan of 3B Scientific Therapy. Our eagle-eyed Product Manager, Zach Montgomery, spotted the connection whilst waiting for snowbound flights to get rescheduled and using the time to visit the EMP Museum in Seattle, Washington earlier this month. 'In Utero' turned out to be a much more raw and authentic Nirvana sound than the previously highly polished work of 'Nevermind'. But it wasn't just the sound that was different. This new album was littered with references to sickness and disease. The album artwork was rather a strange imagery mix of medical, infant and childbirth models. Lead singer, Kurt Cobain, denied that the new album cover reflected his life or his recently acquired status as a father .. but you can't deny that it certainly looks as though there might be a biographical element. Have you spotted what Zach spotted? Yep.. those are 3B Scientific anatomy models. The 3 part Pregnancy Pelvis (product code: L20) and several torso models were used in the original album artwork. Kurt Cobain designed the montage but the other Nirvana band members were concerned that the photograph would cause offence. So the picture was scaled down to a small portion on the back cover to avoid any confrontation with stores such as WalMart who later stocked the album. 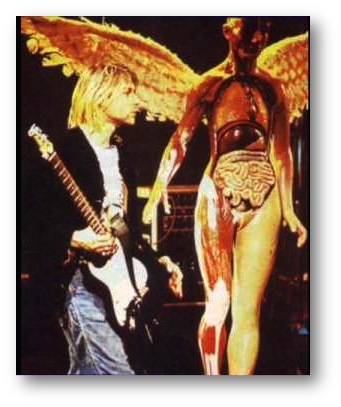 Anatomical teaching aids were also used during Nirvana's 'In Utero' tour. Their use was inspired by the anatomical 'Angel' mannequin used on the front cover of the album. You can clearly see that these are of medical school quality and depict human muscle, digestive and urinary systems as well as respiratory and reproductive organs. The 'In Utero' Angels have become part of the Nirvana legend and have also become rather valuable. 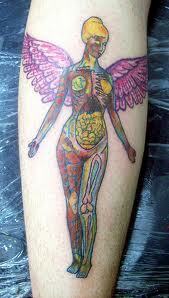 The iconic Nirvana 'Angel' has become so popular with fans that some have even commissioned the anatomical image as a Tattoo. 3B Scientific human anatomy models are especially valuable to doctors, chiropractors and therapists for patient education. 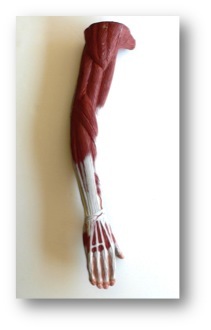 Medical students and biological science teachers regularly use our human anatomy models…. and, it appears, so do rock stars!